Heuer (and later on TAG Heuer) has a strong relationship to racing, hence the names of their watches (Monaco, Monza, Silverstone, Daytona, Carrera and so on). In 1975, Heuer shocked the world by introducing a timepiece with a LCD and LED combination. Quartz driven of course and operated by two separate movements. 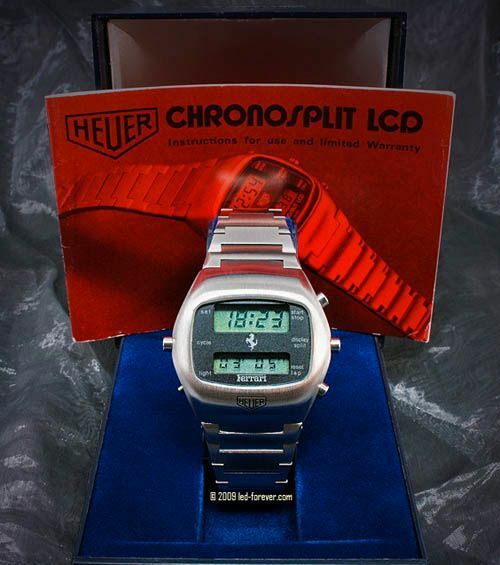 In 1977 – which was a fine year – Heuer ditched the LED display and replaced it by a LCD display as well. The LED screen was a power consuming display which probably caused a lot of reliability issues. 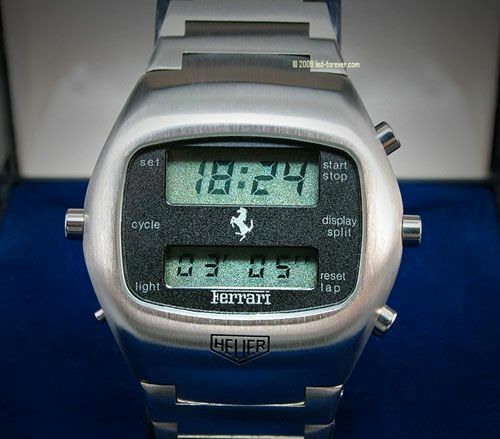 LED-Forever, a website dedicated to these type of watches, has put up one of the rarest versions of them all, the Heuer Chronosplit Ferrari Edition (r102.703-3) as sold in 1978. Famous drivers like Niki Lauda, Clay Regazzoni (read my ME article on this guy by clicking here) and Gilles Villeneuve wore this watch during their racing career. Only 200 of these have been produced by Heuer, and the seller claims that only 10% is still around. The Buy Now option is enabled for no less than $9,500 USD. You must be a true collector or LCD aficionado to click that button. A while ago, fellow blogger Calibre 11 did a very nice write up on the Heuer Chronosplit. Click here.